1. To a rice cooker or a saucepan, add rice, coconut milk, pandan leaves and salt. Cook till rice is well done. 1. To a blender or food processor, add your chillies, garlic, shallot and galangal. Add tamarind water and oyster sauce. 3. Season as per your taste with salt. Heat oil in a pan, and fry your paste till fragrant. 1. Mix flour, cornstarch, salt and pepper. Add water gradually and beat well to a lump free consistency. 2. Add baking soda and mix well again. 3. Coat your fish with batter and coat again with breadcrumbs. For best results, you might wish to freeze the fish so that the mix sets on top. 4. Deep fry fish in hot oil till it gets crispy and golden brown. 1. Heat oil in a pan; add garlic and shallots. Fry till fragrant. 2. Add red chilli and water spinach. Cook till spinach reduces. 3. Add oyster sauce and season with salt, if you like. 1. De-mould your rice from a bowl onto your plate. 2. 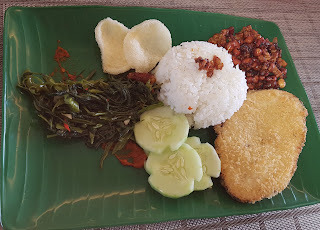 Place your sambal, fish and kangkong in the arrangement of your choice. 3. Serve with cucumbers, orek and kerupuk. 1. Be sure to keep an eye on the rice. Do not cook till too soft. 2. 1 plate is big enough for 2-3 people to share. This recipe is for 4 plates. 3. Shallots refers to the small red onions (same size as garlic), not the big shallots, which I refer to as "red onions"
4. You can Google the brand of 'mock fish' you might prefer to use, because brands differ by locality.